Oldham House and Prospect Place on Wellington Street in Matlock was, for many years, run as a hydropathic establishment by members of the Davis family until it was taken over by the Royal Air Force at the outbreak of the Second World War. After the War it was bought by the two White sisters, Winifred (Mrs. Dimmock) and Annie Gladys (Mrs. Hyde), who ran a private school in the building. Below is a brief account of the Davis family, followed by the story of the school. The story of these buildings begins with Thomas Davis. Thomas had worked a framework knitter before hydropathy became such a runaway success in Matlock and his daughter Rachel, who was important in the history of Oldham House, was employed as a cotton winder when she was young. 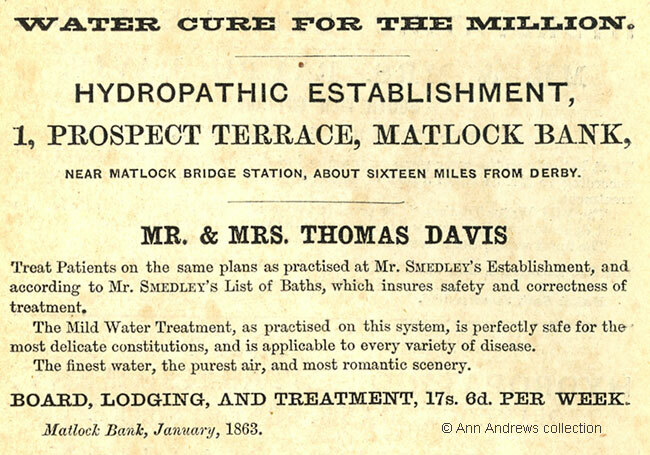 By 1861 Thomas was one of several of the Davis brothers practicing hydropathy in Matlock. Thomas, Horatio, Ralph, Phineas and George were all sons of William Davis and Hannah (née Botham). Not all the Davis boys became hydropathists, but several were key to the success of the industry and they ran establishments that were amongst the largest in the town. When Thomas Davis died in 1891 one of the obituary notices stated that "the deceased was a well-known hydropathist, and was connected with Mr. John Smedley in the founding of the treatment at Matlock Bank three decades ago". Half page advertisement for the Davis establishment from Smedley's Practical Hydropathy, 1963. Thomas Davis had opened Prospect Place in 1859 and Oldham House opened in 1890 with Rachel, by then Mrs. Wildgoose, at the helm; it catered for just ten visitors at that time. It is quite probable that the hydro was named after the abode of Edmund Josiah Wildgoose, a son of Rachel and her husband John, who was working in Oldham as a printer from before 1881 and died there in 1909. It is also possible that it was no co-incidence people from Oldham were amongst the hydro's guests. During the winter of 1893-4 a large drawing room, which faced south and was said to command views of the finest scenery in Matlock, was added along with ten bedrooms. Mrs. Wildgoose advertised Oldham House hydropathic establishment in Kelly's 1895 Directory as having comfortable apartments and experienced bathmen. She and John, a stone merchant, were still there is 1901, having bought the adjoining Prospect Place in 1899. Additions and alterations, overseen by their son Davis Mark Wildgoose who was an architect, converted the two buildings into one institution and included the latest improvements in the treatments provided by the establishment. Rachel died in 1909, aged 72. Lubin George Wildgoose, another son of Rachel and her husband John, succeeded his mother although he had begun his working life as a Joiner's Apprentice. By 1925 Oldham & Prospect Hydro Company Limited offered "tennis, bowls &c; evening entertainments & dancing ; electric light throughout". The postcard above shows the building before further extensions were undertaken and the iamge was used in advertisements until late 1914. Oldham House ceased to be a hydropathic establishment very abruptly one weekend when the Second World War began. Lubin George was 74 at the outbreak of war so it is hardly surprising that by the time the war ended the family's interest in Oldham House was to end. After the War the building's role changed yet again and it went from accommodating paying guests to serving the needs of children, whose parents paid for their education. The following information has been supplied by Colin Goodwyn, to whom I am very grateful. Woodlands School opened in 1925 or 1926 with three pupils. Miss Winifred White, the Headmistress, told Colin that she had taught for a short period in a state school and gave him the impression that she had worked in private schools in the South of England prior to returning to Matlock in 1923 to look after a relative - probably her father, Charles White M.P. The post-First World War hydropathic trade provided a continued demand for local private education for the children of long-term visitors' and, following the death of her father in December 1923, Miss White decided that there was sufficient potential for another small school in Matlock. The family home on Bakewell Road, known as "The Woodlands", provided sufficient space for a few pupils and Miss White's original intention was not to exceed a maximum of twelve. However, over the next few years the numbers increased steadily to forty girls and boys aged from five years upwards supervised by up to four teachers. The Second World War had little effect upon "The Woodlands" other than causing the cellar to be strengthened with railway sleepers for use as an air raid shelter. During the conflict the Government gave considerable thought to the future educational picture. The new all-embracing approach to nationalised education in fact increased demand from parents for private schools to assist their children in passing the selection test (Eleven-Plus) and also for those who failed the test but required something approaching a Grammar school-like education. The day of the dame school, too, was now past due to the requirements for improved standards and equipment and, for Woodlands, this meant larger premises were needed. The need for change coincided with the death of Miss White's brother-in-law, Alderman William Hyde, in Oxford in 1945, and with the return to Matlock of his widow, Mrs A G R Hyde. The two sisters appear to have then pooled their resources and, when the RAF gave up its occupation of Oldham House & Prospect Place Hydro, which had been used for hospital and recuperative accommodation, purchased it. Woodlands School (still known as Miss White's although she was married in 1938) moved up to Wellington Street in January 1946. Within this new building there was space to accommodate boarders. Soon, the school choir was established and, from 1947, swimming lessons commenced at Matlock Lido. Woodlands School Choir became quite renowned and subsequently made many recordings and broadcast on radio. Although the post-1947 establishment was usually described as a girls' school and a preparatory school for boys, Miss White claimed that its principal concern was coaching for the Common Entrance exams, but considerable attention was paid to Eleven-Plus cramming, and pupils who were over CE age were accepted to take GCEs. Administratively, the classes were divided into groups of Junior, Middle and Senior Schools and the pupils were said to be separated by ability rather than age. No class ever exceeded twenty five despite the school once reaching a high point of 260 pupils. For competitive purposes the pupils were allocated to Houses named Hyde (probably after Miss White's sister Mrs Hyde or her late husband), Charlesworth (Miss White's mother's maiden name), Nightingale (after the local heroine) and Bright (reason unknown, though Bright is a local surname); their colours being green, blue, purple and yellow respectively. The uniform was blue (with yellow blouses for girls) but changed to the fairly commonplace grey and yellow sometime after 1947. The school badge comprised a yellow tree between the letters W and S on a grey shield. The school had its own troops of Girl Guides, Boy Scouts, Brownies and Cubs. Mrs Hyde (Annie Gladys R) and Mrs White (Winifred Alice) were the eldest and next youngest respectively of five sisters and a brother who were all born at Bonsall, Derbyshire, between 1884 and 1899 to Charles Frederick White, a boot and shoe maker from Tetbury, Gloucester, and his wife Alice. In 1918 Charles successfully stood as the local Liberal parliamentary candidate. His son, also named Charles (and Miss White's brother), became the Independent Labour MP for West Derbyshire in 1944 and, two years later, Chairman of Derbyshire County Council. Although she retained her single title Miss White was the wife of Bert (Herbert John) Dimmock who had been born in Oxfordshire and died in October 1964, not long after which she suffered a partial stroke. It was doubtless the combination of her poor health, the age of the senior staff and the pressing need for improved standards in equipment and curriculum which ultimately forced Miss White to close her school. An undated letter announcing the closure was sent to all pupils' parents who received it on 23 January 1965 - the day after the subject was published in the local paper. The last day of the last term occurred on 14 July 1965. Miss White died on 16 July 1974, aged 80. 1. 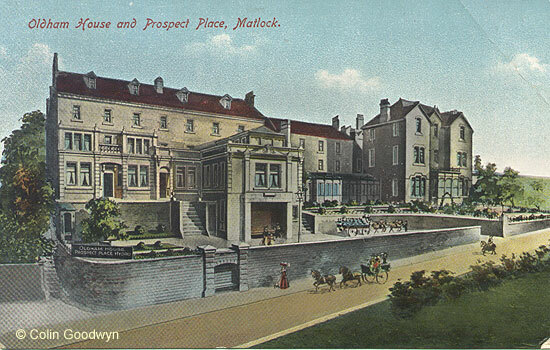 "Oldham House and Prospect Place, Matlock". Postmarked 1912. Postcard image kindly provided by and scan © Colin Goodwyn. 2. Advertisement from "Smedley's Practical Hydropathy", 6th edtn (1863), Published London: Job Caudwell, 335 Strand and others. Image © Ann Andrews collection. 3. Blazer badge from Rosemary Lockie. Information about Woodlands School provided for this web site by © Colin Goodwyn with all other research written and © Ann Andrews. Julie Bunting's book on Matlock has a black and white version of the postcard above - see Books about Matlock. Rachel's birth and baptism are in the parish register; she was one of twins. Also see her entries in the 1841 census | the 1851 census. See the entries for Thomas Davis in the 1861 census | George Davis in 1861 | Ralph Davis in 1861 | Horatio Davis in 1861 (not a hydropathist) | Phineas Davis in 1861 (not a hydropathist). Thomas Davis advertised in "Days in Derbyshire" (1863) by Spencer Timothy Hall. Hall also mentions the Davis brothers in Chapter 5. In St. Giles' parish registers George is given as the child of William and Sarah, which is clearly an error. He was living with his parents in both the 1841 census and the 1851 census. "The Derby Mercury", Wednesday, 5 August, 1891. The report continued: "At death he [Thomas] had attained the age of 79, and the whole of the Davis family are long lived. The father was over 90, and Mr Horatio Davis died at 81, John at over 80, and there are two surviving brothers. These are Ralph, who is 77 years of age, and George, who is 68, both carrying on the hydropathic business at Matlock". Barton, David A. "Around Matlock in Old Photographs", (1998), Budding Books, ISBN 1-84015-076-9. See: Strays: Surnames W. Edmund married in the Oldham District in Q1 1882 and died there, aged 48, on 10 March 1909. "Derbyshire Times", 17 March 1894. Kelly's Directory 1895. Also see: Kelly's Directory 1899. See the entry for Oldham House in the 1901 census. "Derbyshire Times", 3 January 1900. He was a joiner in the 1891 census. There is more about him on Oldham House Hydro, Wellington Street, 1920s. See Schools There's a section that discusses a few key milestones in the development of English State Education, as well as short descriptions of Matlock Schools. A magazine article about Matlock Lido is elsewhere on this web site. There's a photograph of Florence Nightingale, "the local heroine" on-site, plus a great deal of other information including a brief biography of Florence Nightingale. Charles White Snr advertised in Kelly's 1891 Directory of Bonsall.